MOTHER NATURE MATCHED THE NUTRIENTS IN WHOLE FISH, FOWL AND GAME TO PERFECTLY MEET THE NEEDS OF YOUR DOG. How do you know if your dog’s food is Biologically Appropriate™? It’s simple, just answer our Biologically Appropriate™ ‘three meat questions’. 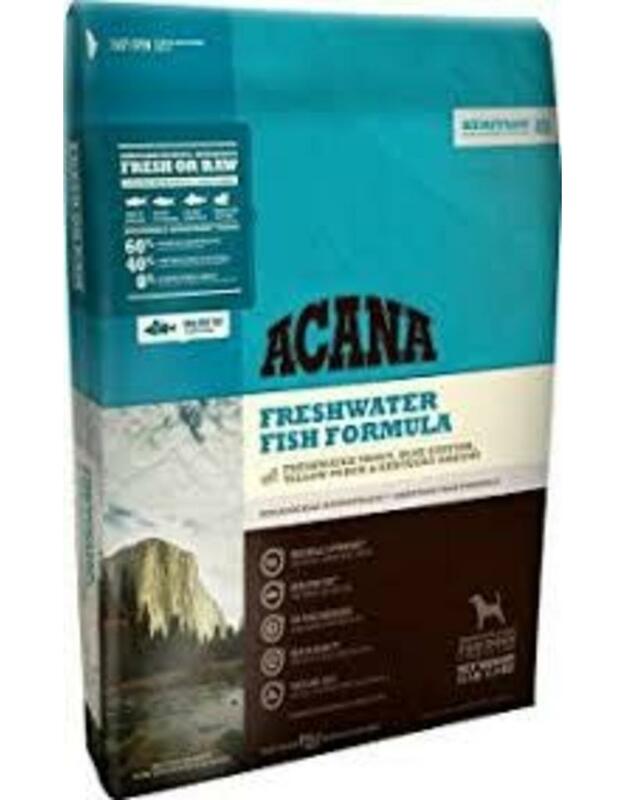 Entirely free of plant protein concentrates, ACANA Freshwater Fish is loaded with 60% fish — up to twice as much as most pet specialty dog foods. 1/2 of the fish in ACANA are FRESH, supplying essential nutrients in their most nourishing form, and the other 1/2 are dried to provide a strong and natural source of nourishing fish protein. 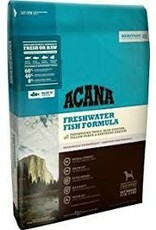 ACANA features three fresh fish in WholePrey™ ratios that include meat, organs and cartilage to supply nutrients naturally and completely. Rainbow trout – fish, liver and cartilage, fresh or raw from Idaho. Blue catfish – whole and fresh from local Kentucky waters. Yellow perch – fish, liver and cartilage, fresh or raw from Great Lake waters. In Mother Nature’s kitchen, there are no synthetic supplements, and dogs and wolves derive all of their nutritional needs by consuming whole prey animals; muscle meat provides protein; liver, kidney and tripe supply vitamins and minerals; bones and cartilage deliver calcium and phosphorus. ACANA mirrors the natural diet, applying our Meat Math and incorporating fish, organs and cartilage in ratios that deliver nutrients naturally. Our foods provide a concentrated and natural source of virtually every nutrient your dog needs to thrive, which is why virtually all of the nutrients in ACANA are naturally present and are not synthetic.